There is a continuing argument over whether the gold price is manipulated and we feel that it is – along with virtually every other market out there – by institutions with sufficient funds to exert a degree of control. That seems to be an integral part of the modern-day investment sector, whether one considers this ethical or not. It is perhaps a key part of the capitalist system where wealth creation and enhancement is the ultimate goal of the financial elite. Is gold a special case? Or is silver? Investors in these precious metals certainly believe so and we feel there is sufficient evidence out there to say definitely yes. And far greater forces than that of pure financial speculation is almost certainly involved, at least from time to time, when for the powers that be things start to be getting out of hand as they see it. Why should gold in particular be a special case? In many peoples’ eyes gold has been the ultimate form of money and indicator of wealth for centuries and since the world entered the 100% fiat currency era after President Nixon closed the gold window in 1971, before which the world’s principal global reserve currency was still backed by gold, many still see gold as the ultimate bellwether as an indicator of the true strength of these currencies and of the dollar in particular. Control the bellwether and you control the herd! The Gold Anti Trust Action Committee (GATA) has preached gold price suppression, implemented by the major central banks (the U.S. Fed in particular) with government support allied with the monetary power of the bullion banks to do so. GATA has been very successful in procuring various government documents, memos and emails which would support their case. This documentation recognises that at various points in time gold has most certainly been on the agenda of the political and financial elite and needs to be controlled due to recognition that the gold price can pose a threat to their economic management and the overall picture they are trying of a stable currency and economy to present to the people. Couple this with ongoing media propaganda downplaying gold’s power as an investment and such intervention can probably be kept to a minimum with investors and markets doing much of their dirty work for them most of the time. But not all of the time! Every now and then the gold price threatens to get out of control and more drastic measures are needed to knock it back. Hence the flash crashes when huge futures transactions, often when major markets are mostly closed, are implemented with the seemingly intended purpose to knock prices sufficiently to trigger stop-loss computer trading and thus drive the price down even further. These are a relatively recent phenomenon and are too frequent to be coincidental. Indeed they are blatant. This was perhaps exemplified – one might say trialled – in the much smaller silver market back in April 2011 when the silver price was soaring up close to $50 an ounce. While silver may no longer be truly a monetary metal it still has monetary correlations in the eyes of many and while the silver price tends to move broadly in concert with gold, but with greater extremes, there would have been the fear that in this case the tail could be wagging the dog and if the silver price was allowed to continue its upwards path it could drag gold along with it. But while the silver price was very successfully knocked back, gold managed to continue on its own upwards path for another 5 months and in August/September 2011 gold fever was in full swing and the yellow metal too looked to be taking off out of control. Cue another huge flash crash, this time in gold. The amount of capital at risk in the futures markets to implement this might be seen as exceptional with the theory that this was put in place by the bullion banks with central banks and government support. True only circumstantial evidence here, but the numbers suggested something hugely more than any normal trading activity. Once this was seen to be successful, so the theory goes, almost every time some piece of government data, or world news, seen as potentially strongly gold positive has been released there has been an almost instantaneous similar, but smaller, flash crash implemented through big futures transactions – always seemingly designed to take the price down to stop-loss selling levels. Coupled with a Fed easing programme designed to boost the general stock markets these have turned investor sentiment away from gold very successfully and the price has mostly been drifting downwards. For more on this subject and more on what’s been happening in the silver market, readers should take a look at my other recent article on this subject on Mineweb – See: Gold price manipulation: Who really calls the tune? and an earlier article What’s with JPMorgan and its massive silver hoard? 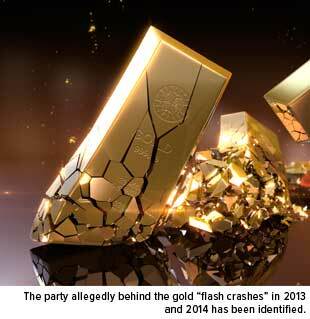 Gold’s flash crashes – what should be done? On a weekly and sometimes daily basis, unbelievably massive gold contracts were coming on the market at non-peak trading hours, only to be withdrawn almost instantaneously. In one particularly alarming instance in January 2014, the yellow metal plummeted $30, from $1,245 an ounce to below $1,215, in as little as 100 milliseconds. Whatever the cause of this behavior—“fat finger” errors, as some people suggested, or “quote stuffing,” as others suspected—markets were effectively shaken. The bullion plunge this week sent the yellow metal breaking below the 100- and 50-day moving averages. Strange dealing patterns are adversely affecting the gold price. These dealings revolve around the “flashing” of massive gold contracts for sale to traders, at a time of day that there is normally little or no activity in the markets, and no news story being released. You can see massive trading volumes every day of over 5,000 contracts, all around the same time. On the first of October, as well as on October 10, there were massive trades of over 20,000 contracts. This amount represents well over two million ounces, or around $2.6 billion. It’s safe to say nobody has that amount of physical gold, apart from the big central banks, so these trades are being done by entities trading gold they do not have in a manner designed primarily to trigger stop loss orders. In recent weeks, there have been concerns among market participants and regulators that the process for establishing the price of gold may lend itself to insider trading and other forms of unfair dealing. The spot price of gold tends to drop sharply around the London evening fixing, or 10:00 a.m. Eastern. A similar, if less pronounced, drop in price occurs around the London morning fixing. For both commodities, there were, on average, no comparable price changes at any other time of the day. These patterns appear to be consistent with manipulation in both markets. Although these “strange dealing patterns” eventually tapered off, it remained a mystery who or what was behind them. Last week, the CME Group officially accused Mirus Futures, a now-defunct brokerage firm, of failing to “adequately monitor the operation of its trading platform,” which resulted in “unusually large and atypical trading activity by several of the Firm’s customers.” This is what allegedly led to the disruption in price discovery in the gold futures market. What’s unclear is how culpable Mirus Futures really was in all of this. At the very least, it acted carelessly. Did its trading platform have a glitch, and if so, when did Mirus become aware of it? Was it deliberately trying to manipulate the gold markets? There’s no way we can know the answers to these questions. That Mirus has since been acquired by another brokerage firm would make any investigation into its intentions—if there were any to begin with—even more challenging for authorities. What I find especially notable, though, is that the firm settled with the CME by paying a fine of only $200,000. This is already a pretty paltry amount, considering how far-reaching its actions (or inactions) were. But when you compare the $200,000 penalty to what Navinder Sing Sarao faces, a huge disparity in the enforcement of such white collar crimes emerges. You might not be familiar with the name Navinder “Nav” Sarao, but it’s likely you’ve heard of the event he’s accused of orchestrating, thanks largely to Michael Lewis’s bestselling book Flash Boys. On May 6, 2010, Sarao, a 36-year-old British day trader, allegedly spoofed American markets using a familiar technique: mammoth-size orders were placed, only to be withdrawn right before execution. Price discovery broke down. In the brief timespan of five minutes, the Dow Jones Industrial Average was taken on a wild 1,000-point ride. Shares of Procter & Gamble fell to as little as a penny. Altogether, nearly $1 trillion in value vanished from U.S. stocks. The maximum sentence for all charges is 380 years in jail. Next to that, a $200,000 fine seems more reward than punishment. You could argue that the upheaval that Sarao contributed to, if not singlehandedly caused, is more significant than the series of gold flashes that occurred in 2013 and 2014. Or that Sarao demonstrated nefarious intentions more unambiguously than Mirus Futures did. Still, the discrepancy is colossal and hard to ignore. “Apparently regulators care much more about manipulation of the stock market than gold,” commented Ralph Aldis, portfolio manager of our Gold and Precious Metals Fund (USERX) and World Precious Minerals Fund (UNWPX). But until gold is allowed to find its true, fundamental value, now might be a good time to accumulate. As always, I recommend that investors allocate 10 percent of their portfolios to gold—5 percent in bullion, 5 percent in gold stocks, then rebalance every year.